Here are theologically sound explanations of the biblical concepts every Christian should know, written in a way that we can all understand. R.C.’s homespun analogies and illustrations from contemporary life make this book interesting, informative, and easy to read. 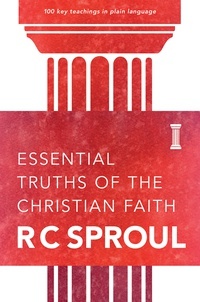 I have read Essential Truths of the Christian Faith cover to cover twice. And have used it as a reference many times over. My second time through I used this book as my daily devotional. This is an excellant book to hand to new Christians and for those not so new Christians you feel are in need of a sound theological base. Light never veils,but reveals every obscurity!! I am a native American from N.M,and was blessed one fine day hearing R.C.on my lunch break.Soon after I sought to gain a clearer understanding of scripture and though bite-size in volume,this book truly revealed the very questions I had in the most understandable way.I thank God every day for the servants He's called to make known the glorious truth and making a way even on the Navajo reservation where much&quot;essential truth&quot; is greatly needed.May the God of the universe bless this ministry abundantly and His enemies be scattered. R.Deale,Shiprock N.M.